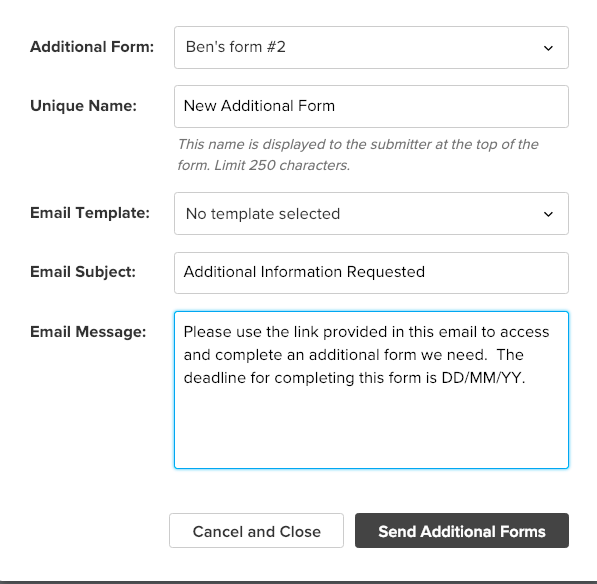 After you've created an Additional Form, you can send it by selecting the submissions/submitters you're sending it to from your Submissions List. Click on Additional Forms in the bar at the top of your list. A dialog box will appear. Select the additional form you want to send from the dropdown at the top of the dialog box, then complete the rest of the fields in the box. When you're done, click Send Additional Forms. Note: You can also send Additional Forms from within the Submission Details page of a specific submission. On the Submissions Details page, select More > Send Additional Form. The Additional Form will only go to the submitter who sent that specific submission.